SYRACUSE – Poop emojis, buns of steel and lightning from the sky. 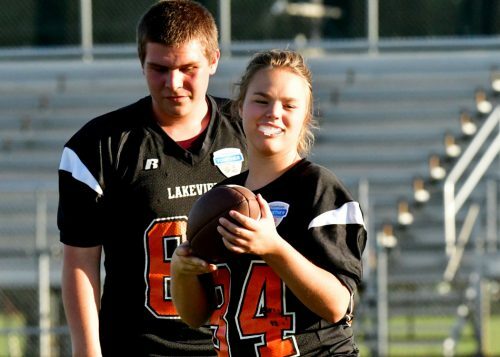 All have nothing in common individually, but all were wrapped into what was the first official day of the Unified Flag Football jamboree Monday night at Warrior Field at Wawasee High School. Rather than the more terse tones of Friday night’s lights and the high school football traditions that we’ve come to know, there was a much more lighthearted vibe to Monday’s season opener. Wawasee, Goshen and Warsaw all met for a round robin lid lifter, kicking off the inaugural season of Unified Flag Football. While each and every participant of the new sport played hard and brought the spirit of football, there were some moments that gave the day a lighter feel. Wawasee coach Andrew Wilson made it known that, on occasion, his team needed to run the poop emoji play. Nothing disgusting about it, just a way for Wilson to make it easy for his players to remember the plays via the popular texting icon in their play calling system. Wilson would make some of the right calls in Wawasee’s 14-6 output over Goshen in the first contest. Cam Mangun and Noah Wilson both had touchdown catches against the RedHawks, Wilson’s of the spectacular variety reaching far above his head to pull in the deep pass from Ray Torres. 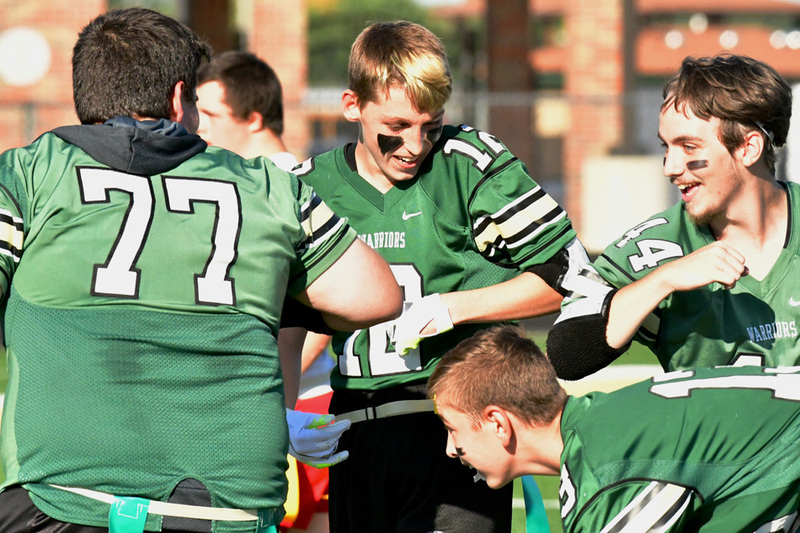 Mangun will get the distinction of scoring the first-ever points in Wawasee Unified Flag Football history. The Warriors would also convert both of their one-point tries. Allen Guthrie scored Goshen’s first and only points of the contest on a halfback pass. Warsaw’s Josh Jarrett runs for a touchdown against Goshen. Game two had Goshen stay on the field to take on Warsaw. Joshua Jarrett will go into Warsaw’s record books with the program’s first touchdown, catching a pass and taking it to the house. 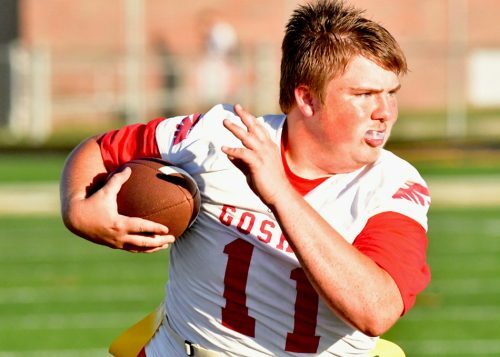 Goshen would tie the game on an Austin Peeler score, but with 53.2 seconds to go in the game, Jarrett – who announced during one play that he was fortified with a backside of steel – found the endzone again to lift Warsaw to the advantage. Jarrett, one of the true characters of day one, later made a pass breakup against Wawasee and said he was bringing lightning from the sky to stop his opponents. Goshen had a chance to tie the Tigers in the final seconds, but Guthrie was stopped just shy of the endzone. “I was nervous and anxious all day at school,” said Goshen head coach Sean Smuts. “Once we got out here on the turf, all of a sudden that excitement comes in and we’re ready to go. We just fought and fought and did the best we could, then go from there. 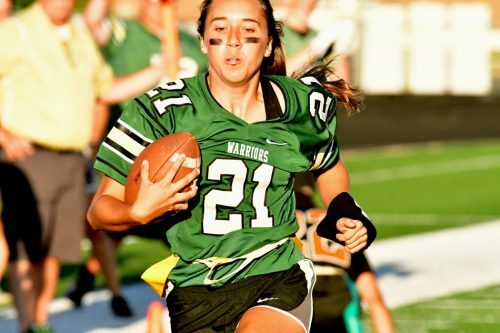 It became an early preview for the W game in two weeks, but Wawasee got out quick on Warsaw with a long completion to Nina Borner and a touchdown scamper from Rhian Galloway. After Noah Wilson knocked away a fourth down pass by Warsaw, he caught a short touchdown pass for a 12-0 lead. Wawasee got inside the Warsaw five to set up Wilson’s score after Carr Reinhard hauled in a long pass. Preston Pruitt converted the two-point try on a 10-yard run to complete the 14-0 final score. 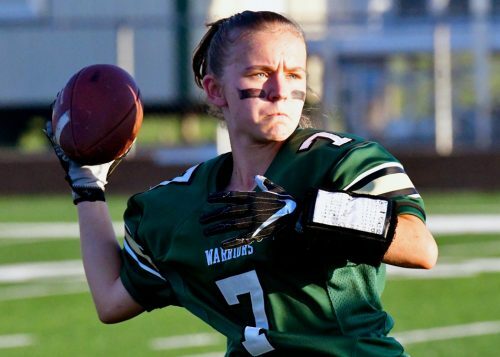 “I’m really proud of what I saw from the team today,” said Warsaw head coach Sam Smyth. “They have come a long way. We got a lot of takeaways and got some long running touchdowns. For the most part, we did everything we set out to do today. I’m really proud of the kids and they way they played today. 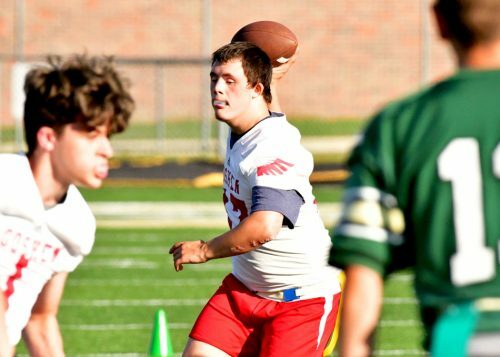 Unified Flag Football, sanctioned this year by the IHSAA, is the 22nd official sport per the association, joining Unified Track and Field in the spring. 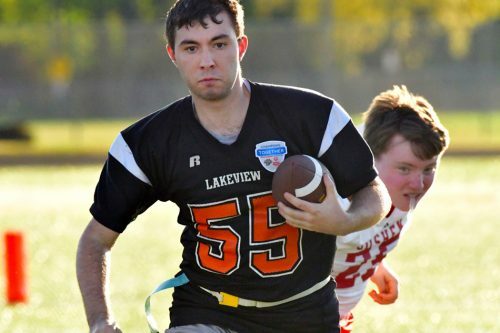 Played with two athletes and three partners, the sport gives students a chance to compete with their peers regardless of their physical or mental status. 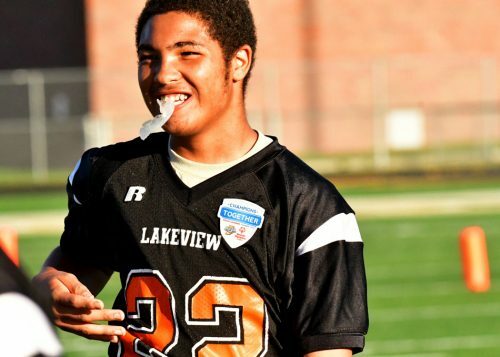 The football postseason will begin on Sept. 29 with the sectional at Warsaw, followed by a one-game regional the following weekend and a two-game state finals on Oct. 12 in Indianapolis. Before that, Wawasee and Warsaw will meet again next Monday back at Warrior Field and Goshen will host Tippecanoe Valley, the fourth team in the sectional pod.